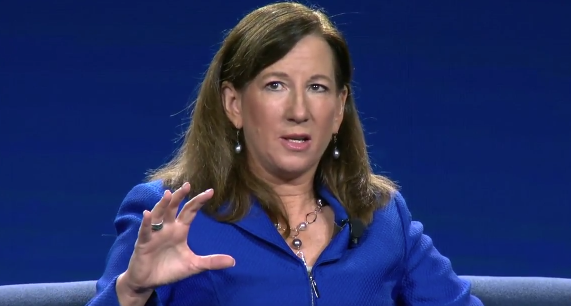 The CEO of Deloitte, Cathy Engelbert, calls the massive changes that are happening in business and society the 3 D’s: Data, Digital, and Disruption. These changes are bringing about new strategies of leadership and hiring and are requiring new skill sets of inventiveness and creativity. It’s a pretty amazing environment when you think about how to invest in AI, social, mobile, the Internet of Things (IoT), AR, VR, cloud, blockchain, or whatever shiny new tool or technology emerges. As a leader, you’ve got to make these choices. I call it the 3 D’s, data, digital, and disruption. Data, you’ve got to treat it like it’s the most valuable asset on your balance sheet, even though it’s not on your balance sheet. Disruption, it’s not the who anymore, it’s the what’s going to disrupt you? Then digital, AT&T is obviously investing a lot around the digital experience and the customer experience. You need a different leader in today’s day and age for that. Think about the reskilling that is going to need to be required. Everybody is worried about the robot apocalypse and are we not going to be doing what we are today in 5-10 years? I read something the other day that said that this is more about mass redeployment, not mass unemployment. It is an interesting time and people are worried. I have a teenage son who came to me the other day and said, Mom, I’m afraid robots going to take over my job someday. I said thank goodness he’s actually thinking about this kind of stuff rather than playing video games. These millennials and digital natives and Gen Z’s are a little worried because that’s what they are hearing and reading and seeing. The World Economic Forum put out a study last year that said 65 percent of school children today will eventually have a job that doesn’t exist today. By the way, back in 1999 at the dawn of the millennium, the Department of Labor put out a report that said 65 percent of school children today will eventually have a job that doesn’t exist today. So it’s actually not a new issue. I like to look at this as disruption is the new normal. This isn’t just in terms of how our business environment is being disrupted. We live in a world now of constant change. The generation of employees that are entering now are coming from this connected generation and they think and work differently. I also think we are in a new era of leadership disruption in terms of how we approach modern problems. What wins in a world of constant change is creating a culture that can lead and create a north star to manage this change. We have to address a concept of leading in a world of change through constant evolution and moving beyond evolution to adaption. Most importantly, recognizing that the single most important thing is it still about people. Is it human-centered? I don’t care what business you are in, in some way you serve people and what we put together is put together by the teams that work for us. So this disruptive element, how do you put together a culture that is creative at its heart but collaborative that in such a way you can embrace the current generations and tomorrows. We have to ask are you looking for incremental and linear improvement or do you begin the conversation of how do you want it to work? When you begin with how you want it to work you can do things that are transformative. And your culture has to create that because at the end of the day in this new disruptive world and the leadership model that we put in place culture wins. I think it has evolved. If you look at what we used to call the Chief Information Officer has moved because now the Chief Information Officer is the Chief Innovator. You can now tap into services rather than building those in the past. I think we are moving deep into the heart of this fourth industrial revolution and while there is a lot of anxiety that comes with that because what we will be doing is probably as disruptive as when we went from an agrarian to an information society. The reality is that the demand for this influx of human talent to do the jobs that we haven’t even defined today requires constant evolution to create those skills.